*So, let’s talk about how much I have no idea what day of the week it is. I wrote this post on Friday, thinking it was Saturday. I realized it wasn’t Saturday yet, so I saved it to post it the next day….except I spent all day yesterday thinking it was Sunday. This is why this is actually getting posted on Sunday. Confused? Yeah, me too. It’s what schools breaks do to you. It’s glorious. *Why do I always manage to go to the grocery store right before a holiday? Granted going yesterday (Friday) was probably a bit better than if I had waited and gone today but still, it was crazy. And I had a huge grocery list of stuff to pick up, so I felt like I was in Wegmans for hours. On the up side, we don’t need to go grocery shopping in our house for….quite awhile, I wouldn’t think. Our fridge/freezer and pantry are all overflowing. *I’ve mentioned that I have a long list of things I want/need to get done over Spring Break, so I took some time out this morning to actually sit with my planner and plan out my week for next week. It keeps me from feeling overwhelmed when I see a big list to plan out what can/should be done on certain days. It doesn’t always mean that everything will get fully done on those days, but having a plan helps. I even managed to schedule a “treat yo self” day in next week because I can’t just spend my entire break doing chores/cleaning and running errands. That’s not that fun. *On the upside, most of the front half of our apartment is neat and tidy and decluttered. That always seems like the easy part of the house to keep together, probably because its also the most seen part of the house. The bedroom, office, and bathroom are the rooms that we can shut a door on and forget they exist, so it’s easier to avoid them. And while the rooms are typically clean, they aren’t the most organized or user-friendly rooms, so they need some work done to them. That will happen this week. *Like Devon did for me last week, I’ll be in charge of dinner this week, since he goes back to school on Tuesday. It’s part of the reason why my shopping cart was so full at Wegman’s yesterday. We don’t typically do a ton of cooking at home during the week because we’re too tired. We do more “convenience” cooking like soup or easy pastas or something like that. But its nice to have more home cooked dinners when one of us is actually home to do it. *I got my Beauty Brands order that I talked about last week. I actually got it a couple days ago so the shipping was super fast, which I appreciate. I’m really excited to try everything. Each item was $5 with the sale and each item normally cost $13-$24, so I’m pretty happy. The Wella deep conditioning mask in the middle smells SO GOOD! I spent like 10 minutes just sniffing it. 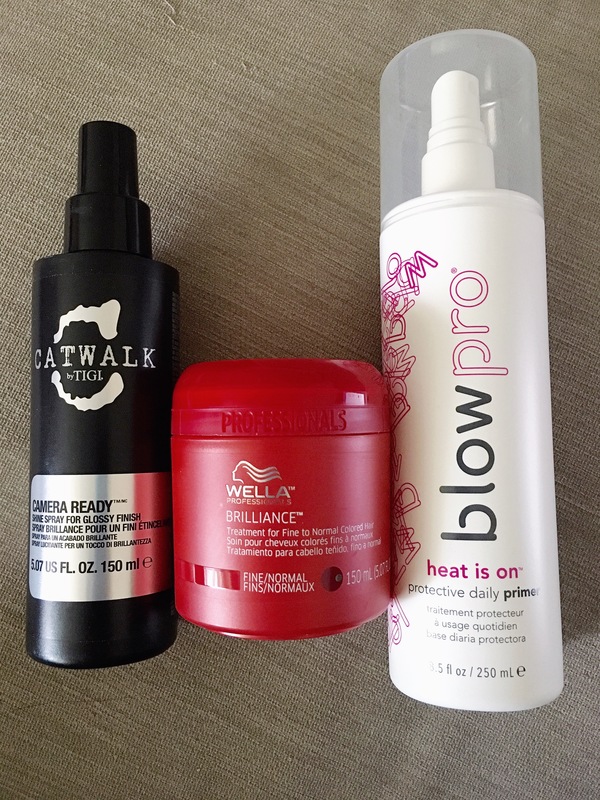 I’ve never used a thermal protection spray (the Blow Pro spray) so Im interested to see if it helps protect my hair a bit better. And I’ve used Redken’s shine spray for a really long time, but the bottle I have is running out so when I saw Catwalk’s spray in the sale for $5 I figured Id give it a try and see how it works compared to the Redken’s.